Google had been advertising its Nexus One on their home page until being supplanted recently by the Haitian earthquake relief efforts. 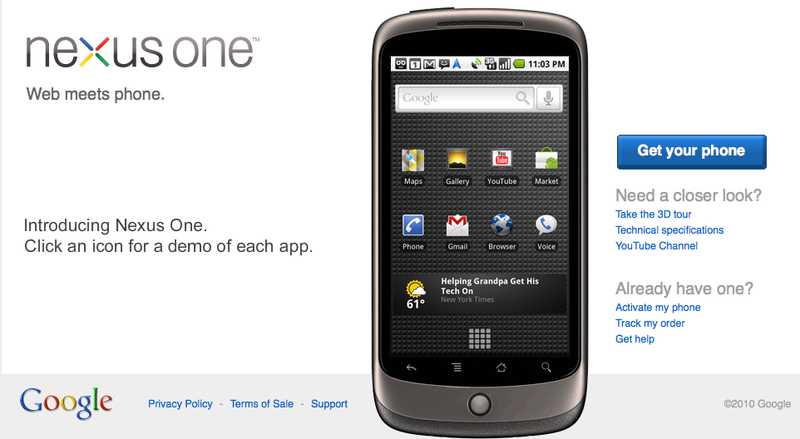 It appears Google has since found another prominent location to advertise and promote their new Nexus One phone – on the YouTube homepage. Clicking the See demo button takes YouTube vistors to a Google.com page with a “Get your phone” order button. I wonder if Google pays full rate to run ads for its own product’s on its own properties? This entry was posted on January 17, 2010 at 9:58 pm and is filed under Display Advertising, Google, Nexus One, YouTube. You can follow any responses to this entry through the RSS 2.0 feed. You can leave a response, or trackback from your own site.